One of my favorite ways to spend a Sunday morning is sipping coffee, listening to The Sunday Blues with Dar , and cooking a big pot of soup. The work is indeed therapeutic for me and I feel the stress of the previous week slip away as I slice onions, chop celery and carrots, and build the foundation of a flavorful meal. Then as the kettle begins to heat up and the steam begins to rise, that pleasant and familiar aroma fills the house and warms me to my soul! To be honest I had misgivings about posting this recipe as the photo is not particularly glamorous and this soup in particular is really quite simple. Then as I thought about it I realized that soup is one of my favorite things to cook, I make it quite often, and it has become an integral part of the culinary routine in my home. Soup is economical as it is often made with the trimmings and leftovers from previous meals, and who can deny the heartwarming qualities of a big bowl of soup and a hunk of fresh bread? So there you have it. This too is a Recipe Randy Cooks. And so it will be included. This soup is a recent favorite and one of the easier soup recipes that I make. The garlic is a recent addition and it not only boosts the flavors but also raises the antioxidant levels of the dish. I guess the jury is still out on the old “Jewish Penicillin” theory but if we can raise the nutritional benefits of a dish by adding a little flavor then I am all for it! It may be surprising to you that with a whole head of garlic in the recipe, the garlic flavor is really quite subtle. 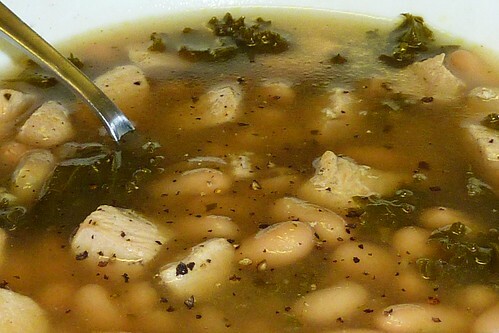 Sometimes I make this soup with chunks (2 cups) of browned Italian turkey sausage; sometimes I make it with chicken. Both are quite good and satisfying. Although I did not do it in the soup pictured, another favorite way to add flavor to this soup is to add a tablespoon or so of pesto to the bowl before ladling in the hot soup. Also of note in the photo, the “garnish” is a few good grinds from a McCormick Italian Herb Seasoning Grinder . I served this soup with a fresh green salad and a warm whole grain baguette. Preheat oven to 425°. Using a knife or kitchen shears trim the top of the garlic head just enough to expose the tops of the cloves inside. Remove as much of the papery “skin” from the outside of the head as you can, without the cloves falling apart. Place the garlic in the center of an approx 12” square of aluminum foil, drizzle with olive oil, and sprinkle with kosher salt & fresh ground black pepper. Bring the foil up around the garlic and seal loosely into a package. Bake for 30 minutes or until the garlic cloves are brown and soft through and through. Meanwhile, place a large soup pot on the stove and bring 7 cups of chicken stock to a simmer over medium heat. Add the beans and the kale, stirring to blend. Reduce the heat enough to maintain a light simmer. Heat 1 Tbsp olive oil in a skillet over medium high heat and season the oil with 2 to 3 grinds from the Italian Herb Seasoning Grinder. When the oil is shimmering add the chicken and 2 cloves of minced garlic and cook stirring frequently until the chicken is brown in places and cooked through, 6-8 minutes. Using a slotted spoon (or a Spider) remove the chicken and garlic from the skillet and add it to the soup. When the garlic is done roasting, separate the cloves and squeeze the contents of each clove into a blender. Add 1 cup of chicken stock and blend until smooth. Add this mixture to the soup, stirring to incorporate. Simmer the soup another 30 minutes to allow all of the flavors to develop. This entry was posted in Poultry, Soups & Stews and tagged beans, blues, Broth, cannelloni, Chicken, comfort, dar, Garlic, grinder, herb, Italian, kale, mccormicks, Pesto, recipe, Recipes, roasted, Seasoning, Soup, Stock, sunday. Bookmark the permalink.